The common lilac (Syringa vulgaris), also called French lilac, has been a gardener's favorite for centuries. Most common lilacs are large, growing 8 to 15 feet tall, with highly perfumed flowers. However, with more than 2,000 common lilac cultivars, homeowners with small yards should not feel left out -- lilac varieties are available in a wide range of sizes, colors and disease resistance. Most common lilacs grow best in U.S. Department of Agriculture hardiness zones 3 to 7, in full sun. They will grow in partial shade, but bloom less. Lilacs produce single or double flowers in spring. Flowers are generally white or shades of blue, pink, lilac, magenta or violet. Common lilacs grow to various heights suitable for almost any garden. Standard common lilacs can grow to about 15 feet tall. The shrubs have a spread of 6 to 12 feet. Flowers may be single or double, and are valued for their beauty and fragrance both in the garden and in cut flower arrangements. "Sensation" features dark purple flower petals trimmed in white that attract hummingbirds and butterflies. "Angel White" is a more heat-tolerant variety, growing to zone 8. This variety grows 12 feet tall with a spread of up to 10 feet, and produces pure white flowers from late spring to early summer. "Lavender Lady" also grows 12 feet tall, with a narrower form at only 6 feet wide. A fast grower and late bloomer, this variety can grow in gardens to zone 8. A mid-season bloomer, "Charles Joly" is shorter than some lilacs, growing to 10 feet tall with a compact 6-foot spread. This double magenta-flowered variety is also a little more heat tolerant, suitable for zones 3 through 8. "Monge," which grows 8 feet tall with a spread of 7 to 10 feet, also blooms in mid-spring, producing deep reddish-purple flowers. This variety is hardy in zones 3 through 7. If you have a small garden space or want to try growing lilacs in containers, choose a cultivar like "Little Boy Blue," also called "Wonder Blue," which only grows 3 to 5 feet tall, with a similar spread. This variety produces sky blue, single flowers beginning in April, and is hardy in zones 3 to 7. 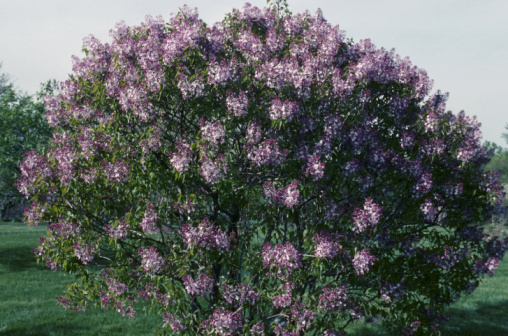 Growing 5 to 10 feet tall with a width of 4 to 7 feet, Syringa vulgaris "Mme. Lemoine" is only hardy in zones 3b to 6b. The showy white blooms appear in early spring and may continue through May. "Marie Frances," hardy in zones 3 to 7, grows 5 to 7 feet tall and spreads 4 to 6 feet. The single, bright pink flowers appear around April and continue through May. Control the height and width of your lilac bushes by cutting them back as soon as the plants finish blooming. To preserve next year's blooms, only remove about a third of the plant's largest branches. If a bush becomes leggy and shapeless, rejuvenate the lilac by cutting it down to about 18 inches tall. The plant will return in the spring, but may not bloom at all until the following year.